Metadata best practices and guidelines function as an essential mechanism for metadata planning, application and management, and interoperability. There has been a rapidly growing body of digital repositories and collections; accordingly, a wide range of digital projects and initiatives have adopted various metadata standards. Because of differences in the formats and knowledge domains of the resources, it is inevitable that these digital projects and initiatives may have different needs regarding metadata. Therefore, when a metadata standard is adopted in various institutions and organizations, it may have to be modified to reflect the community needs and characteristics of given resources. The flexibility and complex structure of natural language allow for the representation of a concept in various ways. Thus, common understanding and definitions of terms in a given metadata standard is essential for quality metadata generation, management, interoperability and resource sharing. This opens up a pressing need for a systematic examination of documentation practices, an area that up to now has been relatively unexplored. 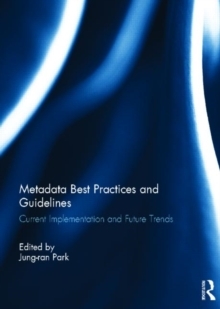 This book begins to fill the research gap through an empirical assessment of metadata guidelines and best practices. This is a book published as a special issue of the Journal of Library Metadata.